There are some soldering applications that require that extra level of precision. Applications where, as you're holding the tool, you really need to "feel" what you're doing. We think we can offer you a solution to that sort of challenge with JBC Tools' new N1738 Sleeves for NP105 Nano-Tweezers. The JBC N1738 Sleeves offer a simple, comfortable answer for working with small or microscopic SMD components. Made from a soft, non-slip material, these ESD-safe sleeves are adaptable to each arm of the nano-tweezers. 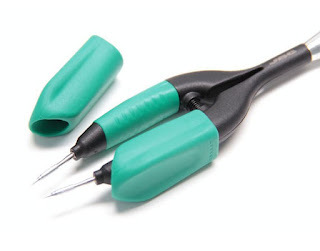 By improving the ergonomics of the tool, the N1738 Sleeves provide better control and optimize the functionality of the JBC NP105 Tweezers (The NP105 now comes with the N1738 Sleeves pre-mounted, but the sleeves can also be purchased separately). JBC is continually working to make soldering and desoldering jobs easier through innovative, reliable tools. QSource.com offers a large selection of JBC soldering and desoldering tools, including the N1738 Sleeves and NP105 Nano-Tweezers. Q Source is your JBC Tools resource. If you need further information about the N1738 Sleeves, or any other JBC Tools item, please contact us via email or phone (800-966-6020). Orders can be placed on our Web site or by contacting one of our helpful sales associates.